This is a class where we put on demonstration assisted by you. Similar to the famous "Master Chef" format. 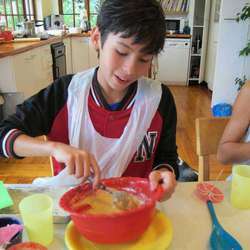 Our Culinary Kids Cooking lessons are for 7 - 18 years. Join our awesome group of Teens! Do you love cooking or are you thinking of a career in cooking? This is the place to be. Cooking classes focusing on the food novice who is too scared to try and the experienced foodie who is always looking for new tips. * Functions - no event too small or too young! * Domestics Beginners & Advanced courses, weekdays and Saturdays. I teach your domestic how to make a range of tasty homemade family meals that every will eat including your fussy children. Excellent referrals, 9 years experience. We will even come to your home to teach your domestic how to make fabulous meals. We offer small classes with a maximum of 2 people wherein you will learn all aspects of cake decorating.